The great thing about the mens loafer is how they traverse the smart and casual world. This can also be difficult in terms of how to dress in them. We have put together a few ideas to help along the way. There are some really formal style loafers around which you can wear just as you would any formal slip-on men shoe. 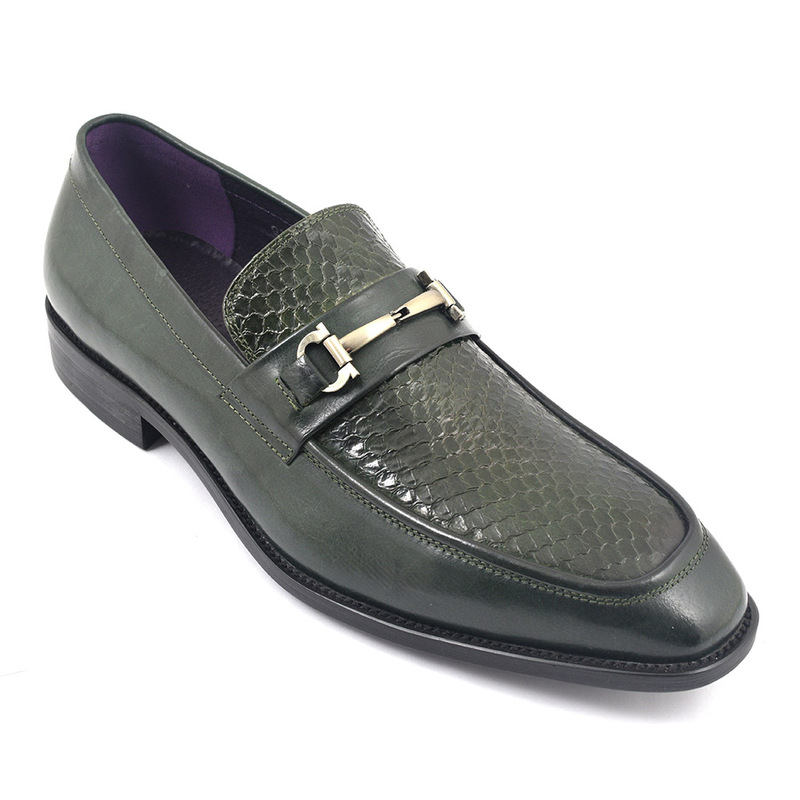 Take the image above, it is our Evasio green loafer with horse bit detail and it is has interest and an air of formality. Now this style of loafer is rather more blue blooded than most and you only have to think of Gucci for a taste of what to expect. Did you know that saddle making was a part of their business and that is where the inspiration for this slip on shoe came from? So, the look is a refined one and means that a suit would look sartorial with the horse bit loafer. Having said that, you could compliment this versatile shoe with a pair of crisp chinos and linen jacket. A slim fit would create a really chic silhouette and no socks a more down to earth chic. Top tip: dust your loafers with talc or even wear no show socks. Try FALKE for invisible socks. We have a lovely selection of loafers in earthy tones such as wine, navy and green. We can see a pair of equally earthy coloured chinos rolled up (try burgundy chino and green loafer) and a clean white shirt tucked in for an “I’ve made an effort’ look. If you want a really relaxed take on this, have the shirt out. For a sophisticated aura, go for a linen shirt and light cotton chino trouser paired with suede loafers. Try keeping everything in the lighter tones for a summer feel and you will find the textures do most of the talking for you. Of course the penny loafer is lovely and casual and you can wear these with shorts and a polo. Again, we think a fitted pair of shorts works better and you can grab a thin pullover for those cooler evenings. We love men looking good at Gucinari and have a selection of loafers for your perusal here.